Every year we talk to a few graduating seniors from each of the three schools in a series we call Senior Snapshots. In this first part, we meet five soon-to-be-graduates from the Albert Nerken School of Engineering: Grace Li ChE'17, Eliezer Lerea EE'17, Yeeho Song ME'17, Andrew Keane CE'17 and Jisoo Park BSE'17. Grace Li, a native of Schaumburg, Illinois northwest of Chicago, arrived to study chemical engineering at The Cooper Union sight unseen. "The first time I came to New York City was to move into Cooper. I missed the admitted students weekend," she says. An internet search had put the Albert Nerken School of Engineering in her sights because her three years at the Illinois Math and Science Academy had engendered an interest in a discipline that fuses math and physics. "I wanted to study something where I could work on building actual things and see results." And she has done just that. Starting in her sophomore year she began working with the "ChemE-Car" team to construct a shoebox-sized vehicle powered and halted entirely by chemical reaction. 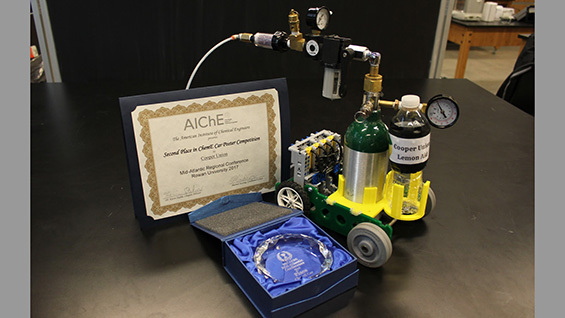 The American Institute of Chemical Engineers sponsors intercollegiate ChemE-Car competitions that measure how successfully the cars carry varying loads across varying distances and stop at the correct point. The variables are given to the teams at the last minute. This year the ChemE-Car team, co-led by Grace, won second place in the regional and the right to compete in the nationals in November. The team called their car "Lemon Aid." "Our car was powered by magnesium carbonate, which is gym chalk, and citric acid. Those react to make carbon dioxide, with water and salt as by-products. We do the reaction in a tank to build up the carbon dioxide gas to create pressure. That pressurized carbon dioxide is filtered and used to power a pneumatic motor we modified from a Lego kit." Why not just use baking soda and vinegar? Because the aluminum reactor tank corroded when used with sodium bicarbonate. In her last semester Grace, along with other members of the graduating chemical engineering class, has been working on designing a cell-based flu vaccine production plant with a target number of vaccines to produce. As she puts it, "We start with an initial material balance. How many cells do we need to grow to produce the virus for the vaccine? How many should we produce for one season? After that we thought about the steps in the process. You have to take cells and start a seed train to incubate them to larger and larger volumes. Then you infect them with the virus in the bioreactor. A series of separation processes gives the inactivated, purified virus at the end. The chemical engineering aspect is the process of it all. It's a biological process, but the separation chain, scaling and linking the units, and conducting economic analysis, that all builds off of our coursework. It's all put together this year." Did we mention that Grace is part of the Chinese Yo-Yo Club? Well, she does that too. After graduation, she starts work at the R&D department of Chemtool, Inc., in Illinois, not far from where she grew up. Looking back at her time at The Cooper Union, she says, "I can't honestly say I remember who I was when I started. While being here I've met some great people, and made some great friends. Everyone's been very supportive." Eliezer (Elie) Lerea, an electrical engineering major with a math minor, views his education at The Cooper Union as fulfilling one of the three foundational practices of his life: academics, his Jewish faith and athletics. Born and raised in the Riverdale neighborhood of the Bronx, he attended Salanter Akiba Riverdale High School, part of an Orthodox Yeshiva academy. "I found out about Cooper through my college guidance counselor in high school," he says. "I was excited about the prospect of going to a smaller school that would let me find a place to piece together different aspects of my life by staying in New York and finding a college with a big Jewish community." Naturally inclined to math and science, he entered The Cooper Union as part of the civil engineering department but found himself drawn to more ephemeral aspects of engineering. "I was more interested in engineering that was not so intuitive to the eye. To look at a building and see how it stands was very different to me than to punch in a bunch of letters on a cell phone and send it halfway across the world. I was really interested in how that process worked." The EE coursework also allowed him to explore a kind of math practice he found to be reassuring. "Here you can't establish any mathematical theorem in any course without proving it. So, when you look at math through that lens you view it as one big world that is completely accounted for through the proofs." His senior project, in conjunction with fellow EE senior and roommate Jason Katz, took its inspiration from a scene in Star Wars where a 3D projection of Princess Leia emerges from R2-D2. "This is our most desperate hour. Help me Obi Wan Kenobi. You are our only hope," she says. The technology, called digital holography, exists in a nascent form. "It's been a ground-up project starting at the beginning of the year with theoretical research, learning about the fundamentals of holography. We've also done a lot of fundraising to purchase the requisite components in order to construct digital holograms." They applied for a grant from the Harris Corporation, and along with funds from the school, purchased a Spatial Light Modulator. 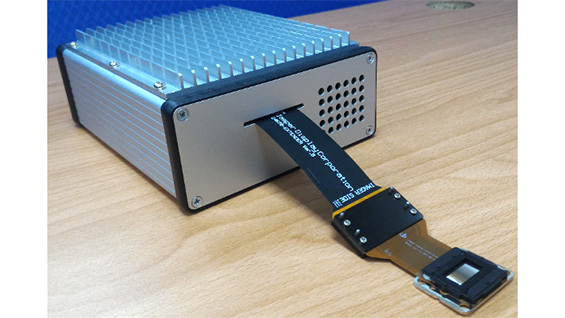 After uploading data to it, the SLM's small screen reacts to a beam of light and modulates it according to the data to produce a 3D projection. "In theory like Princess Leia in Star Wars," Mr. Lerea says, "but there you have full 360 degree rotation. Here you have an angle on the order of about five degrees." The guys are keeping it simple, like a projection of The Cooper Union logo. Elie has done all that while continuing his devotion to learning and education in the Jewish tradition. "I've been on the student board of the Chabad House Bowery, which is a center for Jewish life down the street from here. I've helped organize both daily prayer and weekly prayer on the Sabbath and I've also tried to help organize different classes throughout the years for Jewish students to be able to continue their Jewish learning during their college years." His religious convictions have occasionally conflicted with the academic calendar, but reconciling that has been made easier by a supportive faculty, he says. Unfortunately, because the Cooper basketball team practices and plays on Fridays and Saturdays, Elie's devotion to that particular practice was also challenged, but he found the members of the team still made time to work out with him on the boards during non-Sabbath times. Education will continue to be Elie's focus after graduation, starting with an extended visit to Israel to "re-immerse" in Jewish studies. "Long term, the image I have for myself is teaching. Whether that is in a Jewish capacity or science is yet to be determined," he says. Whatever path he chooses he views his time at The Cooper Union as pivotal. "I have come to understand the importance of rigor in any field of work. That has translated into my Jewish learning as well. It's very easy to skip over material to just do well on the test, for example, but it's another thing to be self-motivated to put in the time and effort to retain the information that will make it stick. That's my biggest take-away." One of the older graduates of the engineering class of 2017 will be Yeeho Song. He took two years off after his sophomore year to return to Korea, where he is from (Mokpo, specifically) in order to fulfill his required military service. During his time spent in the mountains as a member of the special forces, his mechanical engineering focus naturally sought out solutions to problems encountered in the field. One of them became the source of research that has earned him his first published paper and an invitation to the 2017 International Conference on Robotics and Automation conference in Singapore this Summer to present his work. Yeeho wanted to pursue an undergraduate degree in the United States, where, he says, the aeronautics industry, which he found most interesting, is better developed than in South Korea. "Most of my relatives are engineers. It's part of my background. And I was always interested in things that fly or move fast, like trains." His advisor recommended The Cooper Union, so he applied early decision. Since arriving, his interests have pivoted … a bit. Lately he has taken a greater interest in what happens when things get dropped out of flying airplanes. "I served mostly in the mountains, where you can't easily get vehicle support if you are behind enemy lines," Yeeho says. "This is because they have to be air-dropped, which means essentially crashing them into the ground at 20 km per hour or faster. Therefore, they require a lot of packing material, which unless properly hidden, may give away your presence. 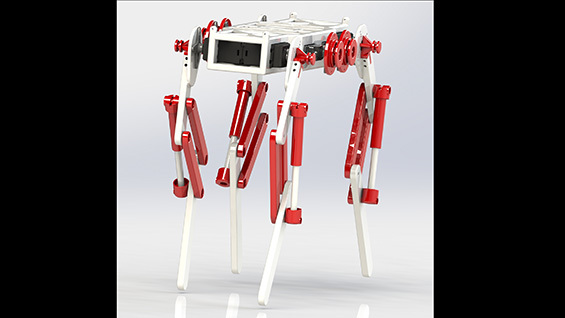 So, I thought it would be interesting to study quadrupeds, four-legged robots, because a) they may work in adverse terrain better than wheeled vehicles and b) their legs may be used for impact attenuation, eliminating the need for such packaging materials." So Yeeho created an independent study in his junior year to develop a scale model of a walking quadruped robot that could better sustain impacts from being dropped. "I had to scale it down to 20cm tall from one meter so I could do the drops here at school. I cannot just go around dropping a 100kg robot every time. The issue when you are dropping stuff is that the mechanical requirements to survive a drop are totally different from just making it walk. So the point of my paper is how you can adapt the design to survive a landing without making it tremendously expensive or huge." After graduating, Yeeho will attend the Robotics Institute at Carnegie Mellon University to study for a master's degree. His official senior project involved "haptic robotics related to teleoperation." In other words, allowing the operators of remotely operated robots to feel resistance encountered by the robot. Force sensors normally manage this but sometimes they are not the best choice. Yeeho and his partners explored ways to detect resistance without as many sensors. The research meshed with his quadruped work. "They need some form of force sensing, otherwise they don't know which feet are touching the ground or which leg it should apply more force on to get traction. I didn't like the idea of adding a force sensor on each foot because you are banging a 100kg object against a force-sensor. It's just not very good for electronics. So, I thought maybe if I merged my research I could have a quadruped with traction control without using force sensors." Yeeho also found time to volunteer for the STEM Saturdays program that started in 2016. For ten consecutive Saturdays each semester, high school students were immersed in a hands-on learning environment geared toward exposing them to the breadth of STEM careers. The instructors are Cooper Union undergraduates and graduate students. "You not only get to teach but you also get to learn from the students," Yeeho says. "When I teach things I have to get a really good understanding of the material or else they will not understand it. And it's just fun. You get to meet kids and talk to them and listen to their ideas that sound crazy but then they actually do it in the end." We first introduced our readers to Andrew Keane back in 2014, when, as a sophomore, he received the Maxwell Lincer Fellowship, one of six annual cash gifts awarded to undergraduate engineering students for exemplary work. At the time, he was unsure what he would do with the money. You'll have to read on to find the answer. Suffice it to say, he did not coast after that validation. He arrived at The Cooper Union from Wayne, a town in northern New Jersey. His knowledge of the engineering school stemmed from his older sister, Valerie, who graduated from the School of Art in 2011. But for him, a talent for math and science met with a different creative interest. "I had a teacher who was a graduate from the architecture program at UVA. He ran a computer-aided design class. That was where I really got interested in architecture," Andrew says. "He told me that if he could go back and do it a different way he would have gotten a degree in engineering first, and then studied architecture. So, I took his advice, and in line with my interest in architecture and the built world, I pursued civil engineering." Andrew’s twin interests synch well with the civil engineering program's senior "capstone" project that requires small groups to identify a site in New York City and propose a constructed building that meets a need there. "We wanted to propose a different type of structure than is commonly done. The nature of the projects, because of the course requirements, tend to be residential and fit into tight lots. We found a lot that is pretty big in Astoria. Then you imagine a structural system and you put that into an analysis program with different types of loads, whether it be from wind or seismic forces. From there you design a structure. So we designed a low building, kind of campus style, as a community recreation center." Andrew thinks about the absence of any aesthetic considerations. "My dream for this project in future classes, and there are some juniors I think who feel the same way, is to develop some kind of link with the school of architecture. Maybe in a previous year the architecture students work on a structure, then those designs are passed to the civil engineering class. And you work together to figure out how to make this thing stand up. I think it would make a really interesting class. It would be nice to get some insight from the people who have been studying the design of these buildings." Degree requirements make interdisciplinary pursuits challenging, he says, since they often do not count toward the degree. Instead he did a deep dive into civil engineering and is already halfway toward completing his master's degree, which he will finish here part-time. Along with the capstone project Andrew has also been involved in on-going research by Professor Joseph Cataldo on the green roof of the Jacob K. Javits Center. 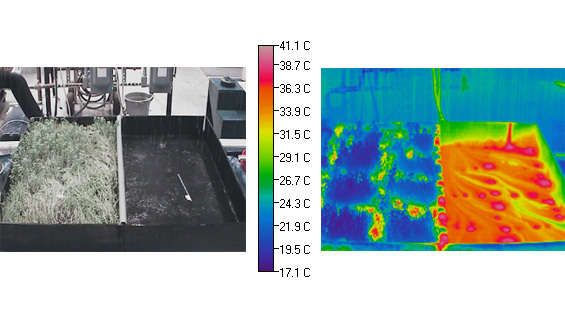 They've been studying heat retention and water runoff / retention using a duplicated section of the Javits green roof, along with a control "black roof," in the basement of 41 Cooper Square. During one part of the research they simulated rain at varied temperatures and took pictures using a thermal camera. "You can see the temperature on the green roof is significantly lower and it's response to thermal stimuli are more muted than that of a control roof." So what did he do with the Lincer prize money? Incredibly he has not yet spent all of it, around $1,000, but he did get himself a keyboard to continue his passion for playing the music of contemporary composers like Philip Glass. That, along with the basketball and soccer teams, has been his main outlet to "get my mind working in a different way." After graduating he will be moving in with his sister and begin work at Guy Nordenson and Associates, a structural engineering firm on the West Side. "Anyone who comes to Cooper for four years thinks about problems differently. More creatively. More methodically," Andrew says. One thing he says he will be tackling: designing, along with his sister, his own bed frame in the new apartment, using some of the remaining funds from the Lincer Prize. Jisoo Park, who graduates with a bachelor of science in engineering degree, has pretty much been doing her own thing for the last eight years. For high school, she spent four years at a boarding school called Indian Springs School, located in Birmingham, Alabama, while her parents lived in Seoul, South Korea. Then, once she arrived at The Cooper Union, she put together her own curriculum driven by an interest in industrial engineering. "In high school I saw a promotional video by Disney about how industrial engineers work behind the scenes at Disneyland," she says. "It really struck me. It showed how much work is being done by industrial engineers to make things run. To think that I could take part in that secret world was exciting to me." A high school guidance counselor told her about The Cooper Union. "My high school was a very small, tight-knit community. You knew all the teachers and even their family and pets. I wouldn't necessarily want that for college, but I was looking for the same community vibe. I wanted personal interactions with my teachers. Also, after four years in Birmingham I wanted to be in a bigger city." Jisoo particularly likes the math that applies to engineering, specifically mathematical modeling, and applying these quantitative models to solve complex problems in society. It's the kind of math that helps different organizations work better or more efficiently. The business applications include maximizing the performance of supply chains and inventory systems. 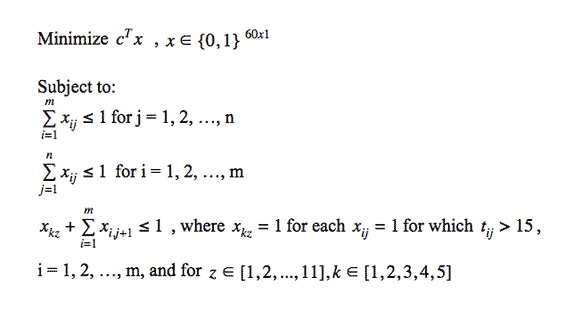 While BSE students do not have a senior project requirement, Jisoo took a graduate-level advanced applied mathematics course called Convex Optimization Techniques. Funnily enough, she made her work relate to her original inspiration: theme parks. "My partner and I chose five different rides we wanted go on at Universal Theme Park in Orlando and we created a mathematical model that would minimize the wait time for each. The assumption was you would rather do something else than wait in long lines. If every line was long and you went at the worst time of day for each, you wouldn't be able to go on all five rides in a day. But if you use our model you would find the optimal schedule to make it possible." Since the Albert Nerken School of Engineering has no industrial engineering program Jisoo worked closely with faculty to build herself a curriculum. "I would have to ask professors if I could take material in a different class, or if they would re-teach a class that hadn't been taught in several years. Or even asking if a professor would be interested in teaching a new subject that I am interested in. So I have to be independent, but everyone was very supportive. Each time I had a problem like this, it got solved." She also founded a club for a chapter of the Korean American Scientists and Engineers Association as a way to foster more interaction with other schools and older engineers in various fields. After graduating Jisoo plans to attend Georgia Tech to pursue a master's degree in industrial engineering. While she was already pretty comfortable being on her own when she arrived here, "Cooper made me become more proactive and independent," she says. These and other members of the class of 2017 graduate on Tuesday, May 23, 2017 at 10:30 EDT. If you can't be there in person you can watch it live on Cooper Union's Youtube channel.